When we opened the doors in May 1993 filled with optimism. Todd’s was the only Honda-Acura specialty service shop in the area; later expanding to include Toyota-Lexus, Subaru and all other Asian makes and models. Our dreams have been fulfilled and we’ve been able to help thousands of clients with their needs and contribute to the community. Our reputation precedes us. All of our customers have experienced a next level service appointment. From the moment you walk through our doors, you’ll notice our cleanliness, professionalism, and our comfortable environment. It’s important that we exude luxury and competence in our waiting area, and that every service we provide does the same. Our small shop is full of specialists that are pleased to make your acquaintance. Immediately, we use our smiling faces to make you comfortable in our waiting area. And we throw in comfortable leather couches, a flat-screen TV, complimentary Wi-Fi, and a Keurig coffee maker. Our customers can make themselves at home while we perform quick and affordable auto services. Check out some reality TV, have a cup of coffee, or even take a nap. You’ll be in and out before you know it. Back on the road to continue your day as originally planned. Inside our 5,000 square foot facility, our ASE Certified techs specialize in all auto services for Honda, Toyota, Acura, Lexus, Subaru, and more. Our community comes to us first because they trust our advanced skills and equipment. The care and concern we have for our community extends beyond their visit to our shop and their vehicle’s excellent performance. Todd’s Automotive is also doing its part to protect our environment, with green business practices and an eco-logical business program. Our techs make it a habit to RECYCLE EVERYTHING, including motor oils and filters, brake fluid, scrap metal, tires, and even used cell phones. As a Master Recycler, we go to classes for several months to learn more about recycling, generating waste, and recycling facilities. We also stay involved with our community through our local and international support of the Lake Oswego Rotary Club. We’re arts lovers so we’re happy to be involved with the Lake Wood Center for the Performing Arts. Your Friends Are Waiting–Give Us a Call Today! We’re the shop in Lake Oswego that you’ve been looking for! Come meet the team and let us show you why we’re the area’s best service provider. Engineers are making vehicles much more sophisticated these days, and we stay abreast of all industry developments. Our customers come to us for a full menu of auto services, from complicated transmission services to top quality hybrid services. Give our shop a call today to schedule your next auto service appointment. 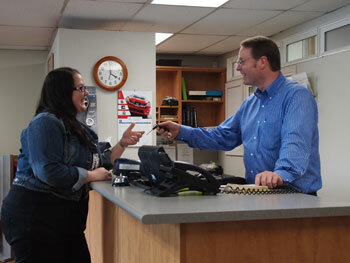 We look forward to taking all of the stress and concern out of your vehicle’s services. To save you some time, you can even schedule your appointment RIGHT NOW! Just use our convenient online scheduling system.